Want to hear what it means to talk without ambiguity about something you really love? Doing his part in our ongoing effort to storm the halls of fishing power and supplant the trout and bass overlords, Garman appeared recently on the same public radio outdoors show I was on a couple weeks ago. He is much more entertaining than I was. I promise. Thanks again to Dale Bowman for the coverage and permission to share the podcast. Check out my previous podcast post for a link to my episode of the show and links to several other episodes with related content. Contact our agents to inquire about optioning our stories for movies or television. And please spend some time at garfishing.com and roughfish.com. You’ll be glad you did. Here’s the man in action, with a longnose from one of the spots he talks about in the show. 1: Bringing in a rope lured longnose. 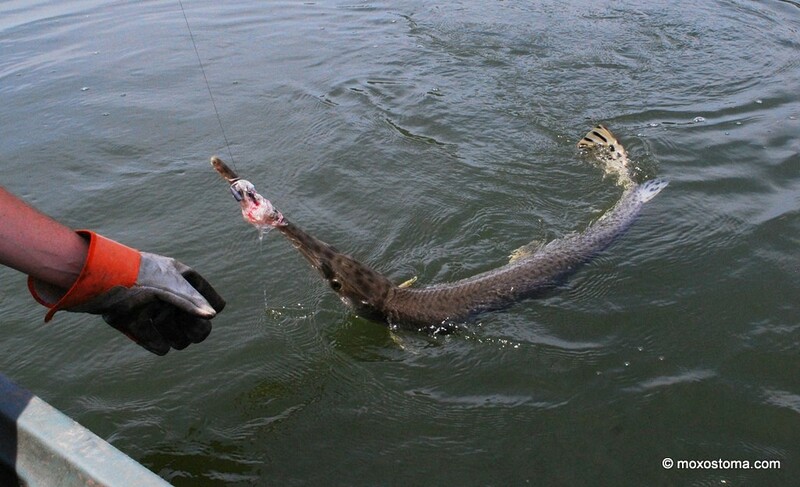 This gar was between 40″ and 50″ (don’t recall exact length) and leaped repeatedly completely out of the water. Despite that, it had no chance of coming loose from the rope lure. 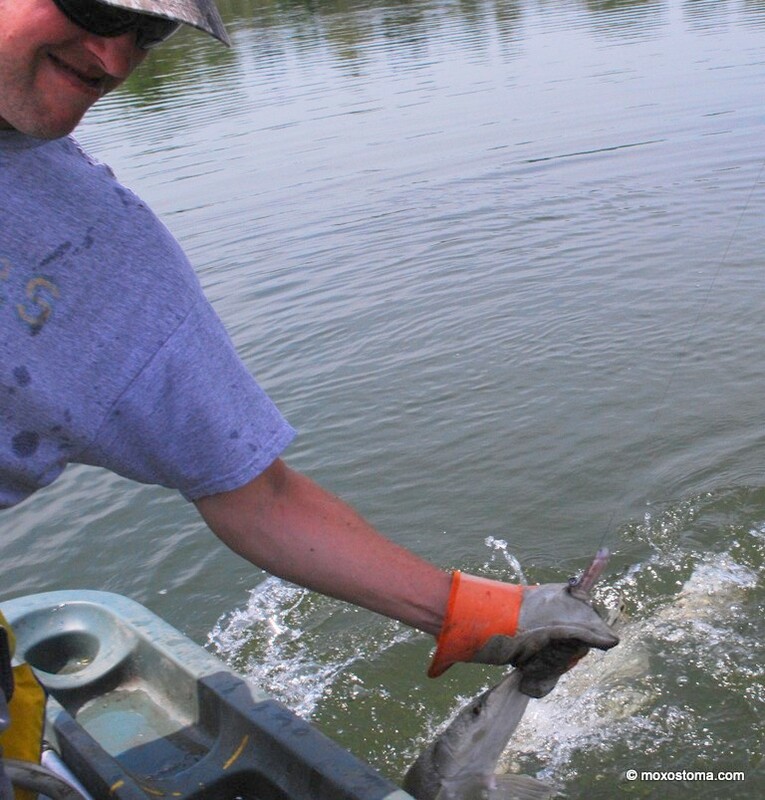 As Garman mentions in the show, sometimes longnose gar have spots on their heads that lead people to mistake them for spotted gar. 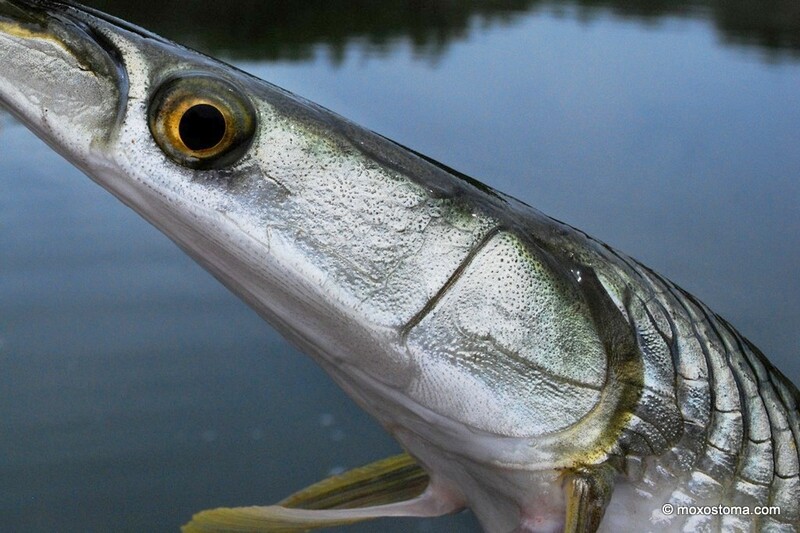 With a beak that long, though, it’s clear what this fish is. 2: Wear gloves and be quick. 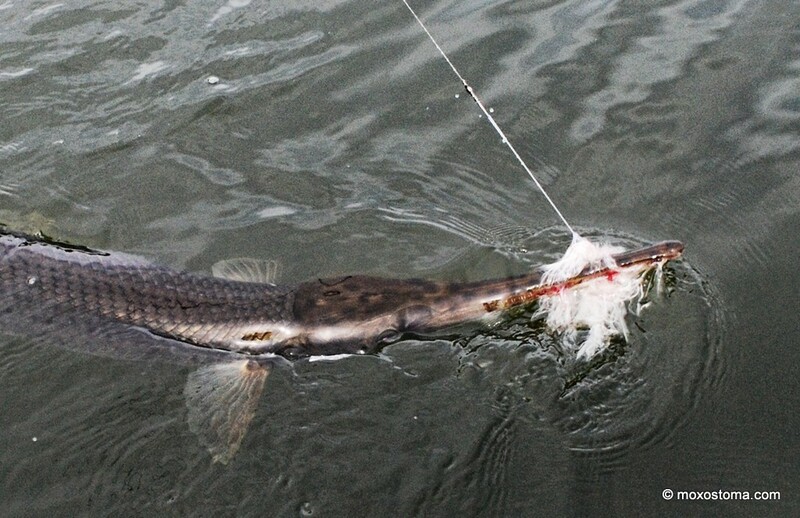 Note that the rope lure is so well tangled in the gar’s teeth that it can support the fish’s weight. 3: Grab the beak with Bruce Lee speed and confidence. The fish will thrash around and if your grip is not solid, you’ll drop it. 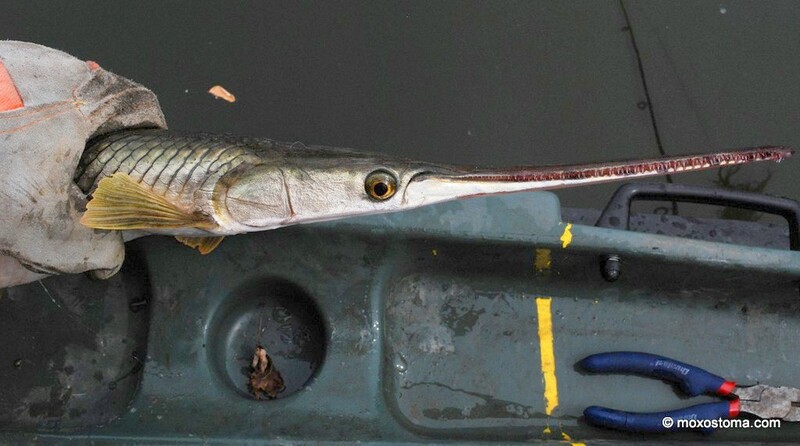 A gar is a lever and has the advantage. 4: Use needlenose pliers to get ALL the rope out of the teeth. 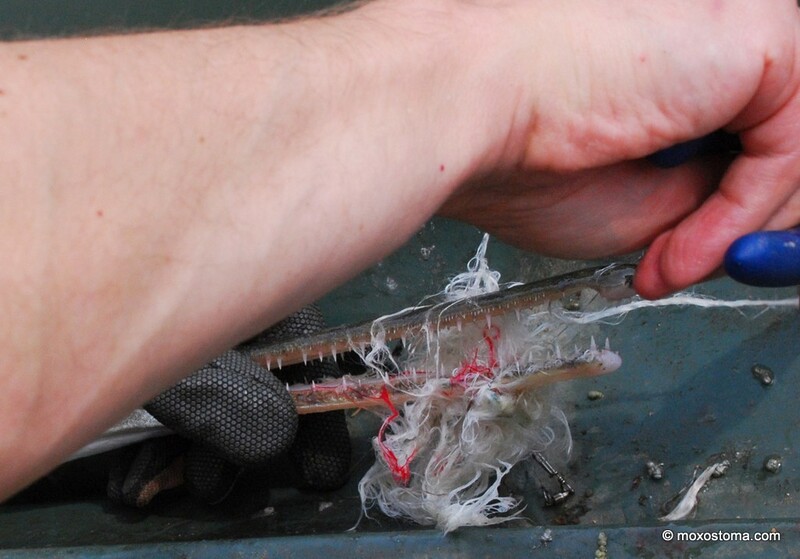 Any fibers left in the gar’s mouth could lock it shut and make feeding impossible. As long as you’ve got a glove on the hand that’s holding the fish, you’ll be fine. Take your time and do it right. 5: Measure the fish. Painting lines at known distances on your boat makes measuring a 4-5 ft. fish a lot simpler than trying to hold it still while using a tape measure, especially if you’re fishing alone or in a small boat. 6: Smile! You have a dinosaur in your hands. Seriously. What could be more fun than that? Only one thing: catching another one. Close up with 100,000,000 years of predatory efficiency. 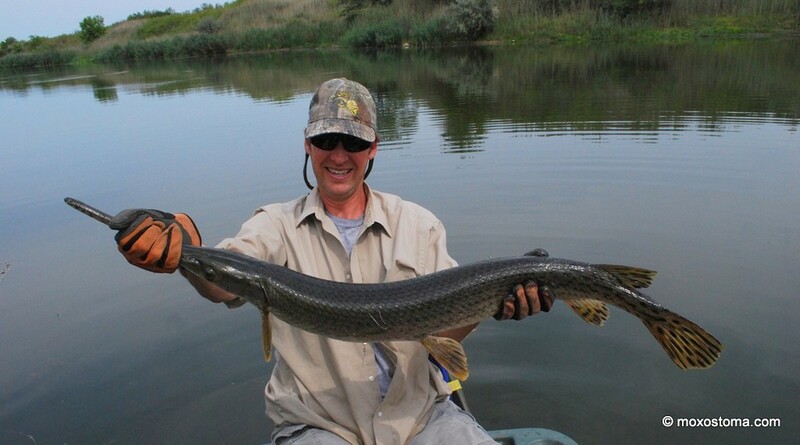 Tagged bowfin, buffalo, fishing, gar, Illinois, respect.